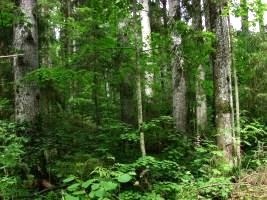 Latvia is located in the contact zone of boreal coniferous forests and nemoral summer green deciduous forests, therefore the species typical for these both forest biomes, can be also found in the forests of Latvia. The typical animals of the Latvian forest fauna are: roe deer, red deer, elk, wild boar, beaver, brown and mountain hare, large predators such as lynx and wolf, and also some small and medium sized predators such as red fox, marten, badger, western polecat and weasel. Most of them are game animals (in total there are 17 game animals in Latvia). Widespread species in the forests of Latvia is also the racoon dog, introduced into Latvia in 1948. Another introduced species is the American mink, which nowadays has displaced the native European mink. Rare special protected species in the forests of Latvia are: brown bear (about 10 individuals), flying squirrel, dormouse (forest, garden, common and fat dormouse), northern birch mouse and several species of flitter-mouse. Otter is also a protected species. Viviparous lizard, sand lizard, blind worm, common Northern wiper and grass snake are some of the reptiles found in the forests of Latvia. Very rare special protected species are smooth snake and swamp turtle. 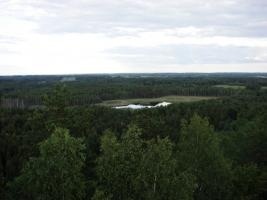 There is a great diversity of bird species in the forests of Latvia. Out of 353 wild bird species, found in Latvia, more than one hundred can be found in forests. Rare and protected bird species in the forests of Latvia are: stock dove, black stork, pygmy owl, Tengmalm’s owl, middle spotted woodpecker, capercaillie, Ural owl, lesser spotted eagle. Very rare and endangered species are: spotted eagle, red and black kite, eagle-owl, roller and green woodpecker. 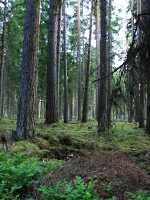 More than 200 tree and shrub species are found in the forests of Latvia, of which approximately half are native species, and the rest are alien species. There are also approximately 300 species of lichens, 298 species of mosses and 650 species of vascular plants found in the forests of Latvia. The main tree species are Scots pine, Norway spruce, silver birch, downy birch, black alder, grey alder, aspen, common ash and pedunculate oak. Other tree species are small-leaved lime, wych elm, fluttering elm, white willow, crack willow, Norway maple, goat willow, common hornbeam – covering 2% of the total forest area. Rare and protected species in Latvia are the common yew, mainly found along the coastline and the common hornbeam, found only in the SSW area. Regarding the introduced species, the European larch, poplars (Populus x Canadensis, P. Alba, P. trichocarpa), Jack pine, Veymouth pine, silver firs (Abies alba, A. sibirica), cedar pine (Pinus sibirica) and Douglas fir, are the most common, which however cover a small area. 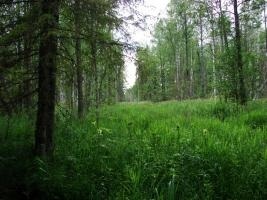 The most common underbrush species are juniper, rowan, hazel, alder buckthorn, bird cherry, several species of willows, as well as fly honeysuckle (Lonicera xylosteum), guelder rose (Viburnum opulus), mountain currant (Ribes alpinum), mezereon (Daphne mezereum). Rare and protected underbrush species are: whortleberry willow (Salix myrtilloides), pallas honeysuckle (Lonicera pallasii), spindle (Euonymus verrucosa), wild cotoneaster (Cotoneaster scandinavicus), black-berried cotoneaster (Cotoneaster niger) and dwarf birch (Betula nana). Typical ground vegetation species of boreal coniferous forests are cowberry, bilberry, bog bilberry, crowberry, chickweed Wintergreen (Trientalis europaea), heather. Unique pine forests with rare and very rare species are found in the valley of the largest river Daugava, where the snowdrop windflower (Anemone sylvestris), owl-head clover (Trifolium alpestre), pyramidal and standing bugle (Ajuga pyramidalis, Ajuga genevensis) and vicic (Lathyrus pisiformis) are growing. Very rare and special protected plant species in the pine forests are neottianthe (Neottianthe cucullata) and cross-leaved heath (Erica tetralix). Typical species of broadleaved forests are dog’s mercury (Mercurialis perennis), woodruff (Galium odoratum), yellow archangel (Galeobdolon luteum), ground-elder (Aegopodium podagraria) etc. Very rare and special protected species are Lady’s-slipper (Cypripedium calceolus), rattlesnake Grape-fern (Botrychium virginianum), Baltic Ivy (Hedera helix).